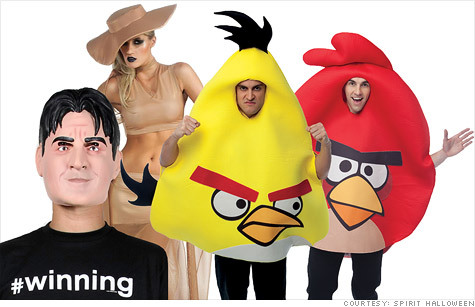 NEW YORK (CNNMoney) -- Tousled hair, a vial of tiger blood and a hefty dose of attitude is all it takes to score a winning costume this Halloween. Charlie Sheen -- a.k.a. "the Rock Star from Mars" -- who caused a frenzy following his departure from the sitcom, "Two and a Half Men," earlier this year is now the top choice for a costume this season, according to Spirit Halloween, the country's largest seasonal Halloween retailer. "His 'winning' attitude certainly struck a nerve," said Spirit President and CEO Steven Silverstein. Although Sheen has been on the Hollywood scene since the 1980s, "he's immortalized himself this year," Silverstein said. In a growing trend toward pop-culture references, top choices for women include Katy Perry, Lady Gaga and Snooki (or any member of the gang from the "Jersey Shore" cast). As for the kids, it's all about the popular mobile phone app Angry Birds. Thanks in part to the AMC series "The Walking Dead," zombies are also making a big comeback, according to a separate report by the National Retail Federation. "Zombies are everywhere you turn and consumers often take Hollywood and pop-culture and turn it into a costume," noted Kathy Grannis, spokeswoman for the NRF. Halloween has also become more than a traditional children's holiday, she said. "Over the last decade, more adults are finding ways to celebrate." Despite the troubled economy, Halloween enthusiasts are planning on sparing no expense this year. Americans are expected to spend an average of $72.31 on costumes, candy and decorations, a 9% increase from last year, according to NRF's 2011 Halloween Consumer Intentions and Actions Survey. Total spending for the holiday is expected to reach $6.86 billion, the most in the NRF survey's nine-year history. A separate survey by PriceGrabber found that 48% of parents intend to purchase a brand-new costume for their child this year. Meanwhile, 24% said they planned to make a costume and only 11% plan to borrow or recycle an outfit. Eighteen percent even plan to dress up the family pet. For affordable options, a Charlie Sheen mask -- complete with mischievous grin -- costs just $19.99 from Spirit Halloween (#winning T-shirt sold separately). The self-proclaimed warlock is also easy to imitate with tousled hair, black-framed glasses and a simple T-shirt and jeans. Charlie Sheen makes peace with "Two and a Half Men"